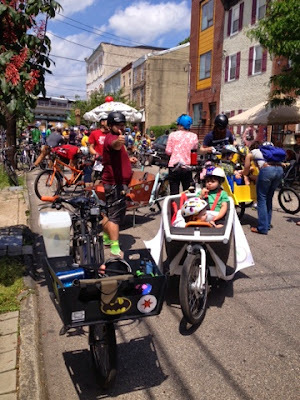 bikeMAMAdelphia: "Not the Children" or How Kidical Mass Rode in the Kenzo Kinetic & Had a BLAST! "Not the Children" or How Kidical Mass Rode in the Kenzo Kinetic & Had a BLAST! 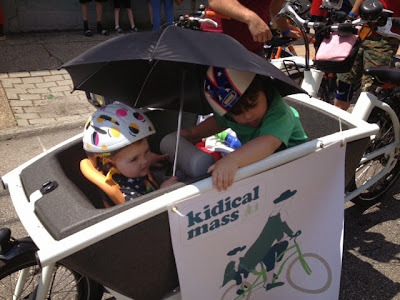 Marni & I setup the schedule for Kidical Mass Spring rides somewhere in the middle of the snowiest winter we had seen in years. 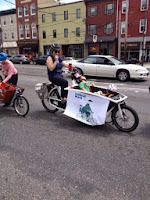 For May we thought about doing a Mother's Day ride but then we thought let's just ride to the Kensington Kinetic Sculpture Derby so we set the date May 17 at the time which seemed an eternity of snowy days away. But this weekend it finally came and it was an amazing time. Sometime in the last few months I tweeted the KKSD and asked if we could just tag along at the end, they said sure why not so a ride originally planned to ride to KKSD was now putting KM into the parade. 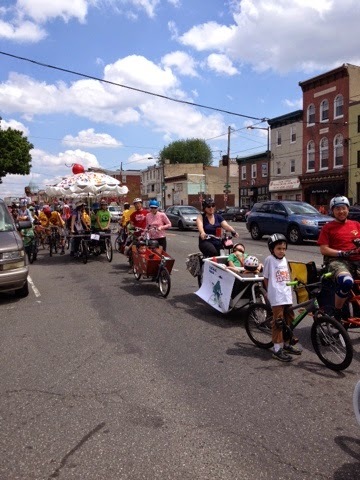 The bike ride between Manayunk and Kensington is about an hour, we rode the kids through the city and down to Norris Street just off the EL. Taking an hour long car ride is boring, going by bike we transversed our city in and out of nooks and neighborhoods. We interact with people on the streets, at one bus stop in Fishtown a women calls out to me how great the bike was and then goes you could put like 4 kids in there I turn and tell the stop please don't wish 4 kids on me, they erupt in laughter, that just doesn't happen if you are driving in a car. By the time we got down there a couple other KM families had arrived and I signed us in and hunted about for a couple other families. 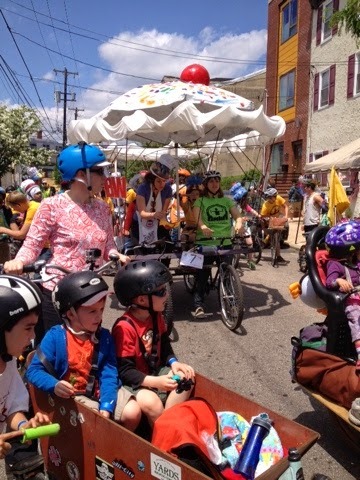 While waiting we were told the Philadelphia Brewing Co. Sculpture would actually be behind us, but in the shuffle we somehow were put between a school and Neighborhood Bike Works, which made us literally in a mass of kids, so fitting since it was #youthbikeride week! 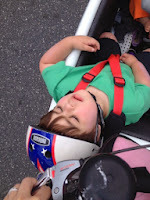 I am sure a lot of drunk Kinetic folks were shocked by all those kids. We rode the route which was about 3.3 miles which is the usual amount for KM rides however it was a parade and took about 2 hours to complete the whole route and there are obstacles! The first obstacle was new this year and it was a "Derby Wash", with foam and water spraying, it was great! M was asleep and was woken by foam poor kid was so confused but it was awesome. We rode down Frankford Avenue to cobblestone streets and since we were on regular bikes it was pretty easy peasy. 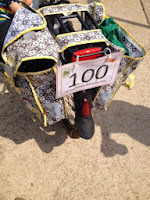 We finally loop around and wait in line for the final challenge a mud pit. I SWORE I WOULD HAVE DIVED OUT BY THIS TIME. But before I knew it all of us parents were riding the kids through. I wound up hopping off and walking my bike through but it was so much fun. 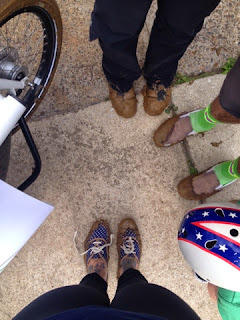 I think all the kids agreed mud pits at the end of every KM ride from now on. Word got back to me that someone screamed "NOT THE CHILDREN" before we went. YES the children :), mud is their favorite. 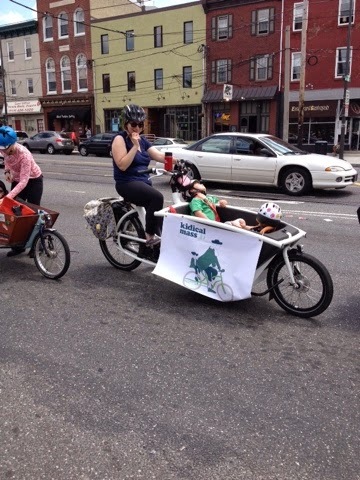 Also word got back to me so I am making the following statement no we were perfectly safe and we are all pretty smart cookies who ride bikes with kids a lot but thanks for asking/judging. NOW next year KM will have to actually compete. I look forward to it. Thank you to KKSD for a wonderful event every year and for letting us participate. We are so grateful. PS Some GoPro clips of the event and YES my battery died literally ten seconds before the mud pit! BOO. Kidical Mass Rides Alone W/ Kenzo Kinetic 2014 from bikeMAMAdelphia on Vimeo.